Draw Something App Reveals The Artistic Chimp In Us All : All Tech Considered The Draw Something app works a lot like Pictionary: You pick a word, draw clues and wait for opponents to guess the answer. But cartoonist Matthew Diffee says the app's name is a bit misleading: "It would be more accurate to call it ... 'Draw Something With Your Foot While Bull Riding On A Boat.' 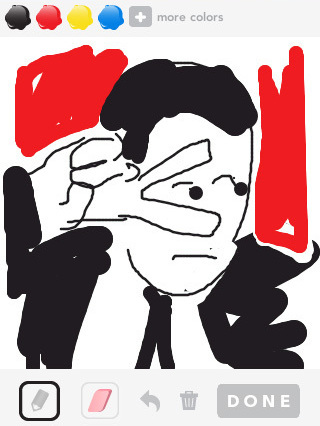 "
New Yorker cartoonist Matthew Diffee tries his hand at illustrating the word "Travolta" using the Draw Something app. Every week, as part of a new tech segment, we'll be digging into our digital sandbox for some fun. New Yorker cartoonist Matthew Diffee is starting things off with a review of Draw Something, a popular app that works a lot like Pictionary: Players pick a word, draw clues and then watch as their opponents guess the answer. But, as Diffee explains, the app's name is a bit misleading. First of all, I think the name "Draw Something" isn't entirely accurate; it would be more accurate to call it "Scrawl Something," because that's what I did. Or maybe "Draw Something With Your Foot While Bull Riding On A Boat." I don't know if I have big fingers or not, but I'm playing it on a phone rather than an iPad, so it's like getting to drive a Ferrari on a racquetball court. It's just frustrating and it's not very responsive. 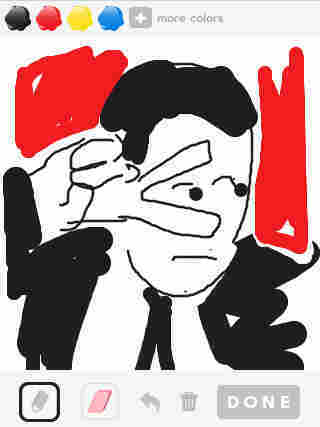 I know how to draw well and so, in my mind, I'm making all these intricate little finger moves. And, in my mind, I'm drawing like a Rembrandt, but what's on the screen looks more like the work of Jimmy, the painting chimp. The word "butcher" yields this original Diffee creation. I sat down for, I thought, 20 minutes, and suddenly I'd been on there an hour. 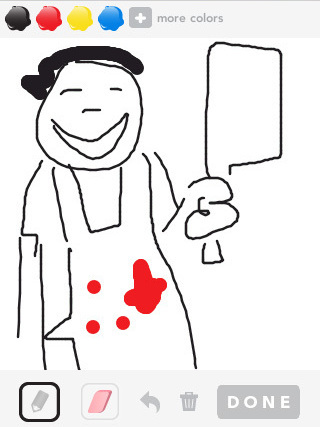 So I would say as a game, it's fantastic — and as a drawing tool, it's pretty terrible. But it's actually helped me in a way. Even in cartooning, I tend to draw things better than they need to be and it's really fun to just sort of relax and just draw something badly. You can share a review of your favorite drawing app in the comments below or send your comments to alltech@npr.org.